The classic design of a highly effective cookware set is brought to you by BergHOFF Earthchef Premium Copper Clad. 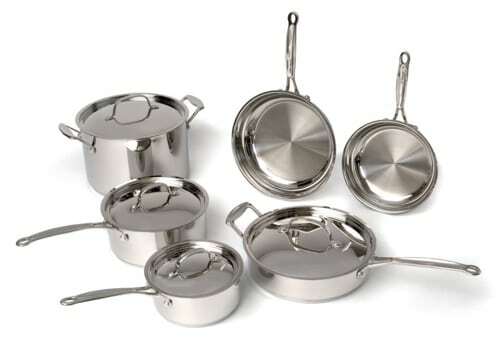 This 10-piece cookware set can replace your old pots and pans or it can constitute a great starting set. 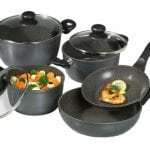 The experience of cooking in these incredible saucepans, fry pans and in the stockpot is appreciated by everyone who has upgraded their cookware. 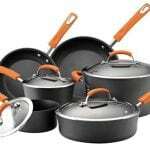 The BergHOFF Earthchef Premium Copper Clad 10-Piece Cookware Set is characterized by a classic design and it is made of stainless steel. The way they look can impress any cook. Besides having just one color and a mirror finish, they look very clean and they are very easy to clean as well. The handles fit perfectly in the whole image of this set. This is because the handles are made of stainless steel as well. Although they are made of the same material as the pots and pans, the handles remain cool. So, the danger of burning your hands does not exist. Every component of this set heats up fast and it retains the heat thanks to the carbon steel memory. In this way, you will save energy and the cooking process will be a lot faster. Time is not something you can neglect these days, so this feature is highly appreciated. You can cook in multiple pieces at the same time and obtain exactly the wanted results. Moreover, you can control the crispness of your preparations because the BergHOFF Earthchef Premium Copper Clad 10-Piece Cookware Set is non-sticky in a less traditional way. BergHOFF is a company founded in Belgium, in 1964. The quality of its products has led to its expansion throughout the world. Its team comprises 12 thousand members. It is an industry leader and it has become one by improving its products continuously. The materials used for manufacturing BergHOFF’s cookware and tableware are revolutionary. The manufacturing techniques can be characterized as innovative and always developed with the idea of protecting the environment in mind. 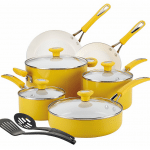 BergHOFF does not only produce stainless steel cooking sets, but it also uses porcelain. The barbecue items do not miss from their offer either. Clean and elegant design – The mirror finish of the stainless steel give elegance and a clean look. Highly durable and effective – The stainless steel and the copper core ensure a long-lasting period of usage and effectively retain and distribute the heat. Diverse and safe – All 10 pieces from this set have a well-defined purpose and handles that ensure a safe grip. Usable on every cooktop – You can use this set on gas, electric, ceramic or induction cooktops. Energy saving and non-toxic – The pieces do not release harmful PTFE fumes, they use less energy and transfer the heat fast and evenly. 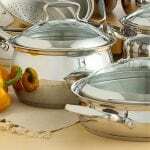 Discoloration of the interior – Washing this cookware set with the wrong products can lead to damages. The cleaning products must be non-abrasive or citrus based and the steel wool must be avoided. 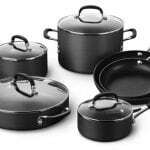 The BergHOFF Earthchef Premium Copper Clad 10-Piece Cookware Set is a complete set that can meet the needs of an expert or amateur cook. 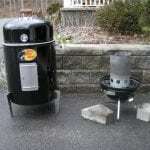 The distribution of heat and the enhancement of the cooking process are great advantages. With this set, you can enjoy the perfect balance between elegance and effectiveness.